Alrighty then! Let's do this robot thing! First though, THANK YOU all for participating in my little survey from last week. A lot of my questions were answered and a lot of my gut instincts were validated, so thank you. I really do appreciate the feed back. I'm happy to be back to blogging again and while I can't promise daily post, I do look forward to more post than I've been doing. If you've been a long time reader, you know life has thrown me off track a bit for the last year and half or so and I've been struggling to regain balance and creative flow. I feel like the fog has lifted though and I'm excited to be back doing something that I enjoy so much. So, let's talk Robots shall we? I'm going to break the tutorial up into two parts. Mostly because these aren't super hard to make, but they are time consuming and the tutorial will be long if I do it all in one. Plus, having a part 1 will give you time to collect all the supplies. Part 1 will mostly focus on getting ready. And, Part 2 will be the hands on, step-by-step. We are going to make the little guy shown above. The trick to making these look the best they can is to add personality in your add-ons and placement of the parts. 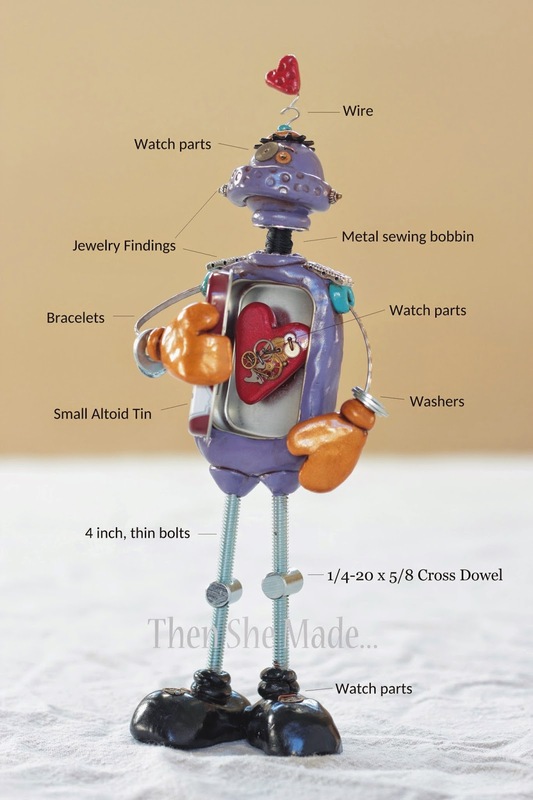 We'll talk more about that when we start to construct him but you will want to start thinking about what kind of items you will be adding to him. I tend to use what I have and I use a mix of things. I also like to use "found" objects. So watch parking lots and check your junk drawers, you might find great treasures - if it's metal, it can probably be added to him. Metal Washers - I use three different sizes to make bracelets and I have these solely because I raided my husbands tool box. It was nice of him to share, unknowingly of course. I think that sums it up. If you have questions or need more details about anything, shoot me an email at thenshemade(at)gmail.com and I will do my best to answer your questions. Just keep in mind, it's fun to be creative with the little details. 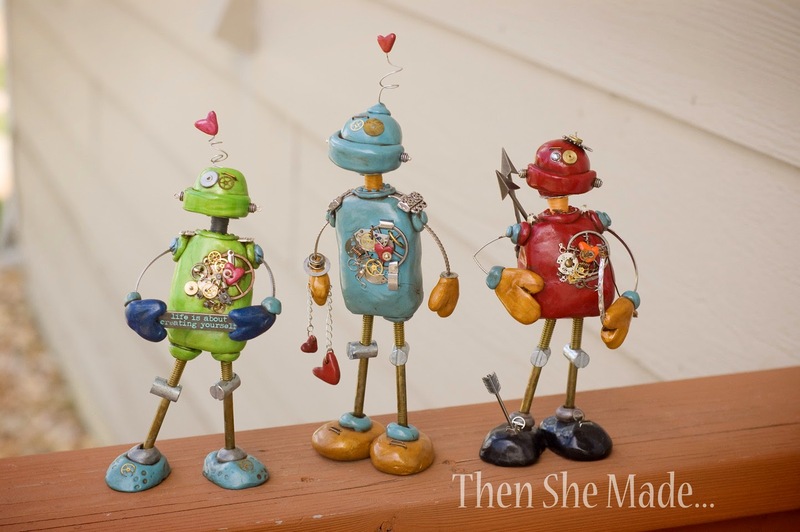 Below is a photo of three other robots I've made, take a look at the details to get an idea of how to add personality and quirk those your creation. And, I'll see you in a day or two with Part 2 of our tutorial. amy, these are stunning! love them. so nice to see a new post from you! Thank you very much for this, I'm looking forward for part two! These are so cute! I can't wait to make some. Thanks so much for sharing. This is SOOOOOO CUTE!!!!! OMG!!!! I'm already a polymer clay freak. But this... this just proves why I love Valentine's Day and Polymer Clay and OMG!! THIS IS SO cute!!!!! Thank you so very very very much for sharing! Anyone else find it ironic that you have to prove you're not a robot to post a comment? LOL!!! Hi!! i am soooo looking forward to making one of these adorable guys! however, being from canada I've found it really hard to track down altoids! i did eventually find a tin but there was only one size available - could you tell me the measurements so i know if i have the right one or if i need to improvise a little with a smaller tin of excel gum i found. Thank you! !